In this story you will hear about a volunteer project that the Cold Spring Fire Department recently took part in. Due to United States regulations on the safety of old fire equipment, Cold Spring and many other fire departments must dispose of perfectly good equipment. A Minnesota volunteer chapter stopped in just last week to pick up some of the old equipment and eventually ship it off to a fire department in Chili that is in desperate need of it. This is Fire Prevention Week across the country and in the "Land of ROCORI" the fire departments will be visiting Elementary Schools and promoting FIRE SAFETY in the home. Wednesday night, October 7th, the Cold Spring Fire Department will be driving around town @ 6 PM as a reminder to families to practice their home fire drill and family escape plan. 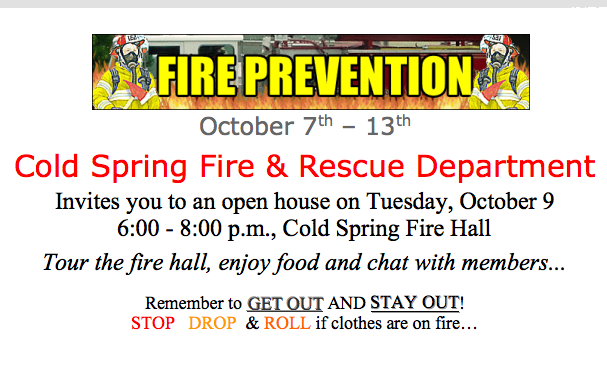 Then there will be an open house down at the Fire Department located in City Hall in Cold Spring. Did you know that more teenagers die on prom night than on any other day of the year? With ROCORI holding their prom on April 18, 2009, we all should take a moment out of our day to watch this powerful presentation. In this story DigElog ROCORI takes a trip back in time almost two years ago as we captured a presentation given by the Cold Spring Police Department and Students Against Drunk Driving (SADD). Even though the story is two years old, its relevance cannot be denied. Here's a first hand look at how car, truck and SUV roll overs relate to life or death based on the simple principle of buckling your seat belt. This is a must watch for anyone who drives or rides in a vehicle. No one ever plans to have an accident and this video will convince you as to the value of buckling your seat belt before you head out of the driveway. Minnesota is a great place for the outdoor sportsmen. Whether it be hunting fowl or hunting deer there are a number of things to focus while you are in the field. Ralph Leither has been hunting for over 35 years and had time to sit down with us and explain some safety tips for your next hunt. He goes over some of the gun carrying laws and at the end he does a step by step of how to properly clean a gun. This story is a follow up story and is the second portion of DigElog’s coverage of fire prevention week. In this story we feature members of the Richmond Fire Department illustrating the importance of fire safety to young children. A special thanks goes out to all of the volunteers at Richmond Fire Department for their services in promoting fire safety and also for all of the work they do to keep the community safe. Last week was fire prevention week and the Cold Spring Fire department was out in the community educating kids and parents about the importance of “exit plans” and also other fire safety precautions. Members from the all-volunteer department drove out into Cold Spring in the fire trucks while handing out candy, pencils, and other goodies. This story features footage from the evening’s activities as well as an interview with Cold Spring Fire Chief, Jim Maile. Please stay tuned to DigElog ROCORI to see how the Richmond Fire Department helped promote fire safety awareness. Members of the Cold Spring Fire and Rescue Department will visit Cold Spring Elementary and St. Boniface grade schools on Tuesday, October 9. At 5:45 p.m., fire trucks will travel throughout the community promoting operation E.D.I.T.H. (Exit Drills In The Home). We encourage everyone to plan AND practice your escape routes. and view the newest truck, unit 14, the tanker. For more information, call 320-685-3653. The Richmond Fire and Rescue Department would like to remind all residents that October 7-13, 2007 is Fire Prevention Week. On Wednesday October 10, 2007 beginning at 7:00 p.m. members of the Richmond Fire and Rescue Department will be driving the fire trucks through the streets of Richmond to promote fire safety awareness and to distribute 2008 Richmond Fire and Rescue Calendars. We ask that you please “Practice Your Escape Plan” and come outside to meet the members of the department. Fire prevention is about the three "P's". Plan, Prevent and Practice. Here's a first hand look at how car, truck and suv roll overs relate to life or death based on the simple principle of buckling your seat belt. This story captures a demonstration made at ROCORI High School by the Cold Spring Police Department and Students Against Drunk Driving (SADD). This is a must watch for anyone who drives or rides in a vehicle. No one ever plans to have an accident and this video will convince you as to the value of buckling your seat belt before you head out of the driveway.